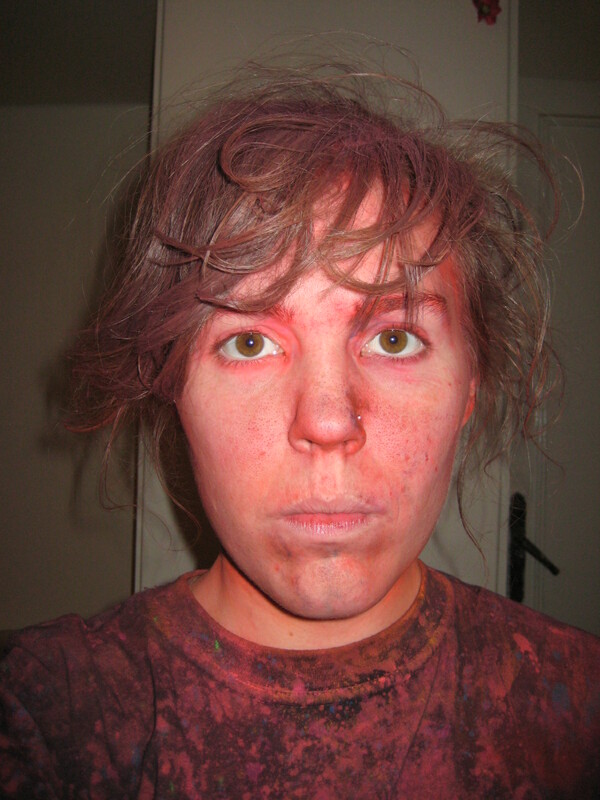 Post-color festival. Other people didn’t look so zombie like. Get into a cab. Make your way out of the city. Creep through traffic, past dust colored high rises and the artificial billboards that appear like fungus sprouting out of urban decay. Countless anonymous storefronts whizz by. Mosques, churches, and government buildings hunch near the highway. Soon you’re in the new part of Cairo, the one only rich people can afford to reach—a land built on the pretext of endless land and resources, a place made for cars and conspicuous consumption. Welcome to “My City,” a satellite community where one apartment costs a king’s ransom. This “city” sprouted up from the desert when someone watered the sands. There is grass here, and fountains. Though many of the hundreds of apartment buildings lie vacant or unfinished, you can here the whispered dream of escapism. Wind your way through the eerily verdant complex. Find the sporting club. Get your ticket. Go through the outer gates. Push your way through masses of girls in the 2 stall bathroom to change your clothes. Enter the inner gates. Get two packets of powdered neon paint. Forget everything. You’re on a green lawn now that buzzes with hundreds of wealthy Cairene youth, all in various stages of succumbing to neon colors. Cairo is somewhere else, along with its social problems. Now is the time to enjoy the mild autumn weather and frolic and dance around on a live green canvas writhing with youth coating themselves in a thick layer of imagination. As you become your neon self, your old life seems so earth toned, so depressing. Why not stay here forever, where people can afford to buy bottled water at twice its normal price just to mix it with paint and spray it at people? The dj’s beats make the air pulsate and there are moments you think you might dissolve into the ether along with the paint splattered masses around you. But then you realize that you’re starving, and the only place to eat at this freaking festival is one sandwich shack that sells exorbitantly overpriced, mediocre fare. You’re at the mercy of your hosts, and you must try to forget your own hunger until they are hungry. The mixed paint in the water bottles starts looking like delicious neon food. “Where am I?” you wonder, as you absentmindedly go for a taste. It’s disgusting. You try it a second time but you definitely don’t do it again after that. Soon your initial wonder at this event is replaced by seething rage at the injustice of it all. “THIS MUST BE STOPPED. EQUALITY! FOOD FOR ALL!” you think as the music continues in spite of your internal objections. Finally, hosts get hungry and it turns out they brought some sandwiches out in the car. After inhaling one, the injustice of it all seems more bearable. You go back and enjoy your time, and then eventually leave the land of color on a long journey home, back to a world of grey covered in night. Oh my goodness, is that really a picture of you! I would have liked to have seen your bright , sparkling smile. You do have one , don’t you?????????? I enjoy reading about your adventures. Love you…..
My smile was quite brilliant and sparkling…especially so because of the contrasting colors of my face.